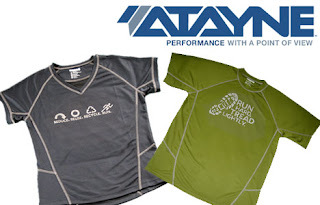 Runner's Tech Review is back with a new posting about ATAYNE's technical shirts. We've been testing these high quality shirts made out of 100% recycled materials since December. With their great feel and cool looks they've certainly found a place within our running clothes collections. I wasn't feeling great this morning when I got up and quickly decided to rest instead of run. The weather may have contributed to a headache and although it wasn't yet raining, I knew it would start soon. I needed rest and figured not running may be more beneficial than an actual workout today. Tomorrow I plan to be back to the street. I'm going to run in my Brooks GTS 10's to see if it's the lightweight Sauconys that have been helping my performance or if I'm just getting faster. I'm betting it's the shoes.